A handsome bush, not at all trailing, from three to nine feet high, with dark-brown, prickly stems, fine foliage and flowers, and conspicuously beautiful fruit. The leaves are nearly smooth, with three leaflets, and the flowers, about two inches across, are a brilliant shade of deep pink, not purplish in tone, with yellow centers, and grow singly, or two or three together. The fruit is a firm, smooth raspberry, over an inch long, bright orange-color, more or less tinted with red, with a rather pleasant but insipid taste and not very sweet. This grows in woods. It is rather confusing that this should be called Salmon-berry in the West, for in the East that is the common name of Rubus parviflorus. 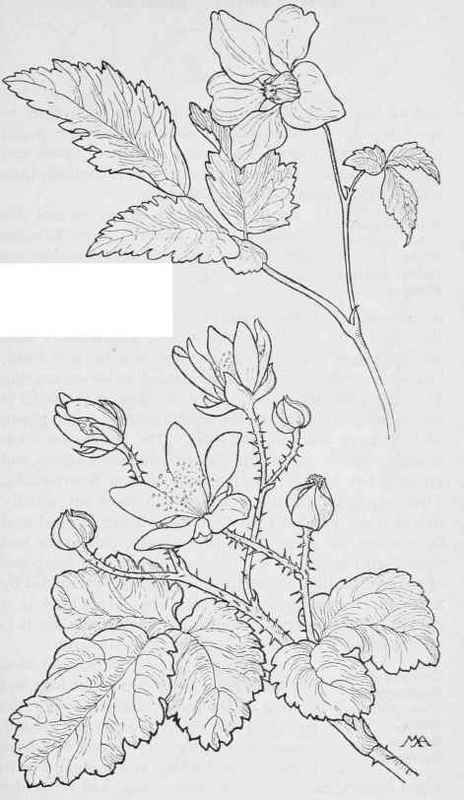 Salmon-berry-R.spectabilis. Common Blackberry- Rubus vitifolius. ROSE FAMILY. Rosaceae.